First, I’d Like to Thank…. A few weeks ago I received a WordPress notification of a comment from a new blogging friend, Olivia. There’s no easy way to say this without sounding like I am bragging, so I’ll just put it out there. 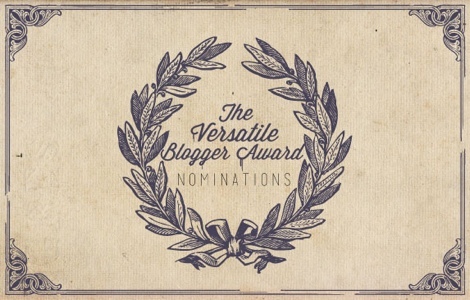 She nominated me for the Versatile Blogger Award. Being just a newbie in this blogging world, I feel honored and excited that someone who’s been blogging for so long thought of me when she had to list 15 blogs she enjoys! Thanks so much for the nomination, Olivia! After a brief stint as a paid blogger for the state teacher’s association (with almost no feedback), this cyber award is worth so much more to me than a stipend. Isn’t that what everyone wants? A little recognition? A little affirmation?Absolutely! 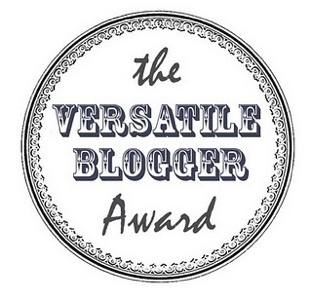 So here are 15 blogs that I nominate for the Versatile Blogger Award. I feel a little humbled to be awarding awards to people with so much more experience but each of these blogs has inspired me in some way over the past two months. I already feel connected to each of these bloggers. Each one of these people reminds me of a small part of myself. 1. From the Desk of Mr. Foteah (http://photomatt7.wordpress.com/) An elementary special educator who obviously loves his kids. 2. Looking for the Sweet Spot (http://lookingforthesweetspot.com/) A 40-something mom of 2 with a great sense of humor. 3. Teach for the Win (http://teachforthewin.wordpress.com/) A new teacher who believes all children can learn. 4. Jean Day Friday (http://jeandayfriday.wordpress.com/) A very witty teacher with 2 kids and husband who is also a teacher. 5. Differentiation Daily (http://differentiationdaily.com/) This blog is on “Summer Vacation” but it is full of great resources for differentiated instruction. 6. Old Teacher New Tech (http://oldteachernewtech.com/) A veteran teacher with a 2012 attitude towards technology. 7. AuburnChick’s Adventures (http://auburnchick.wordpress.com/) Attitude and inspiration! What more can I say? 8. Watch Erin Teach (http://watcherinteach.wordpress.com/) An honest, thoughtful, and thought-provoking teacher. 9. This, That and the Other Thang (http://thisthatandtheotherthang.wordpress.com/) So so so funny. This blog always puts a smile on my face! 10. Lessons from 40 Something (http://40somethinglessons.wordpress.com/) I am closer to 40 than 30. Yikes! There is something “relate-able” here. 11. jeremyhyler40 (http://jeremyhyler40.wordpress.com/) A middle school language arts teacher with great ideas for teaching writing. 12. Lowcountry Chalkboard (http://southcarolinasmiths.wordpress.com/)A special educator with great ideas for organization and classroom management. 13. Diary of “and frankly…” (http://alycianeighbours.com/) Love the concept behind her blog. Read “My Story – Deciding to Dance”…..Worth. Every. Minute. 14. 365 Life Lessons (http://365lifelessons.org/) Photography and quotes from real people. Two of my favorite things! 1. A simple thing I’ve always wanted to be able to do: dance. I don’t mean like professionally. I mean like for fun: at weddings, at proms, at bars. I am absolutely jealous of people who have the bravery, the carefree attitude, and the “I don’t care how stupid I look” mentality. 2. A thing I will do only in the presence of a few people: sing. I have a horrible voice but that doesn’t stop me from singing in the car, with the kids, and occasionally, in the presence of Admiral Bodee. 3. Consequently, I love the Wii game, Just Dance 3. I can dance and sing as loud and as crazy as I want in the privacy of my living room. I am terrible at it, but I still have fun. 4. We did not own a video game system until Christmas Day 2011. I have always been anti-video games with the exception of the Nintendo DS which was pretty much a car ride only activity. I broke down this Christmas and bought a used Wii on eBay and am happy with the amount my kids do not play it. Two days ago we turned it on for the first time since May 28th because it was just too stinking hot to play outside. Everything in moderation. 5. I desu ot eb yrev tneulf ni gnitirw, gnidaer, dna gniklat sdrawkcab. (Translation: I used to be very fluent in writing, reading, and talking backwards.) My best friend, Ycats, and I used to write notes to each other in high school backwards and in cursive no less!! 6. At one time in my life I was allergic to milk, beef, wheat, vanilla, and green peas. My diet consisted of fruits, vegetables, and chicken. At that point I learned to try a lot of new foods and flavors. I can now eat all of those foods in moderation. 7. My high school burned down – thanks to an arsonist – when I was in 10th grade. It’s something you always “wish” would happen, until it does. I talk about the fire every single time we have a fire drill at school. The kids roll their eyes every single time. What a terrific blog – congratulations on such a well deserved award! Good for you! By the way, where did you go to high school? The school I teach at had a fire in 1990 (I wasn’t there yet), and they had to move to the IX Center until the front of the building was repared. Since you went to OU, I did not know if you were Ohio born and raised. Wow! Not the same school, but what similarities! My fire was in 1990 also, but we were transferred to a branch of Kent State University. Thank you sooooo much, Melanie! I have enjoyed reading your blog, and thank you for reading mine. I will work on getting that reward reposted soon. Thank you again!!!!! You are so welcome! Looking forward to another great post today! Out of curiosity, do you write way ahead of schedule or do each of your blogs come to you fresh each day? I have been averaging 4 posts a week and that is a lot of work! I don’t know how you do it! It is daily. It is an undertaking. Some days I dread it; some days I cannot wait to sit down at the computer. It is always an honor to be recognized by fellow bloggers! Thank you so much! You’re welcome! Your blog was one of true very first I found and followed. Thank you for being an inspiration! Thank you! I still feel like the new kid on the block when it comes to blogging – I am so proud I was able to inspire. Oh, and I forgot to mention that your list of blogs is a wonderful resource for other newbie teachers like myself. Thank you!! Thank you and you’re welcome?!? 🙂 So happy to have met you! Awww…thank you for the award, my new bloggy/teacher friend! I want you to know that you inspire me with all of your experience and wonderful, practical ideas for reaching at-risk students. I look forward to your posts and cannot wait to try out some of your ideas in my classroom this year!! More than the award, I appreciate you as a reader. Not just scanning through another post, but stopping and really reading it. YOU are why I write. Thank you. You’re so welcome! Thank you for writing such great reading material!